Your simple step-by-step guide on boiling food. 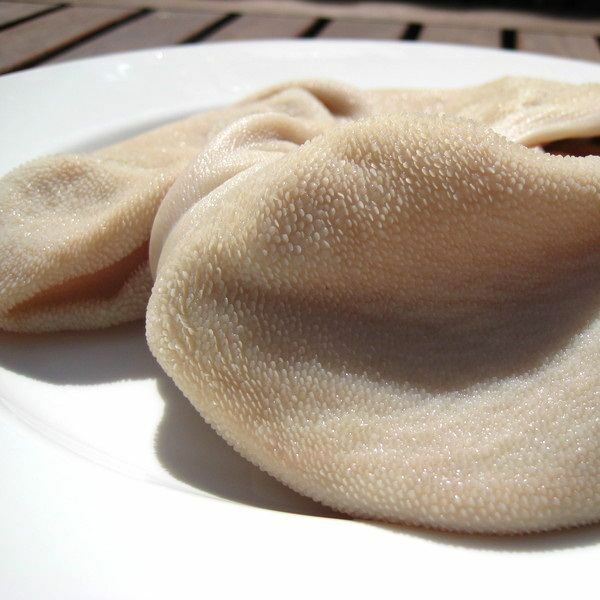 To get rid of odors, before cooking, frozen cleaned tripe thawing, carefully divide and rinse with cold water. Put in a pot, pour boiling water and cook about 5 minutes. Then we drain off and rinse with cold water. Again translate into a pot, pour boiling water and this time cook about 15 minutes, then drain off again. If the guts are fresh: very thoroughly clean the - first with a knife. Then thoroughly rinse several times in warm water. Drained sprinkle a thick layer of salt and scrub with a stiff brush until they are quite clean. Then again intensively rinse under running water. Yes cleared guts pour cold water and leave it for at least an hour. After that time, we translate them into a pot, pour cold water and bring to boil. Remove them from the pot and pour fresh cold water. Tripe pour broth cooked earlier. We cook for 1-1.5 hours. If necessary complement decoction boiling water. When the intestines are already soft, add cooked vegetables separately. 15 minutes before end of cooking we add salt and season to taste, preferably by adding marjoram, nutmeg and ginger. Cook covered. Well cooked tripe should be so soft that they can rub his fingers. Tripe usually given with fresh bread and accompaniments, eg. Meatballs or dumplings made from potatoes. To ready-made tripe you can also add beef and finely chopped vegetables (except time), which were used to prepare the broth.